Homepage Formula E What's Not To Like About The New Formula E? What’s Not To Like About The New Formula E? I started reporting on the FIA Formula E from the 2017-18 season. For the upcoming season, I will be posting regular updates on the all-electric series on my blog too. There’s so much to like about the new Formula E series. Here’s my list! Is 2018-19 finally going to be the year when Formula E stakes its claim as a credible and must-follow international racing series? This is the single question that is driving worldwide chatter around the all-electric racing series as it gears up for its opening round in Saudi Arabia on Saturday. For us, the prospect of the new Formula E cars being able to go the entire race distance without a ‘car swap’ isn’t enough, nor is the prospect of the new teams and drivers that have joined the series this year. These two aspects are standard for every other racing series — although we accept that these are a novelty to Formula E. To us, it is Formula E’s overall packaging that is appealing — a fun, funky, tech-savvy and young racing series that seems within reach of anyone who loves racing. Since inception, Formula E has suffered from constant and seemingly obvious comparisons to Formula 1. Even though the all-electric series keeps emphasising that they aren’t up against Formula 1, we see a strong possibility that the two series could merge eventually; something that even the 2016 Formula 1 World Champion and now an investor in Formula E, Nico Rosberg commented upon a few months ago. First, Formula E does seem to be delivering on their ‘future of racing’ promise while keeping costs in control and a road-relevant focus on technology; two key parameters that have seen the world’s largest manufacturers flock to the series in the last few years. Second, both Formula 1 and Formula E are owned by John Malone — when would it make sense to consolidate one’s Motorsport investments? However, such a merger seems light years away, possibly another lifetime and Formula E by no means signals an end to fossil-fueled racing (your interests in Formula 1 are safe!). In this post, we will use Formula 1 comparisons to offer a perspective rather than take away Formula E’s attempts to create its own space in the world of racing. The Gen2 or the Generation 2 car made all the right noises since its day of launch more than a year ago. We definitely belong to the tribe who believe that it is the Batmobile in real! The radical car design appealed to fans and racing car drivers world over. While being interviewed by us for Firstpost earlier this year, Formula 1 driver Esteban Ocon admitted that the new car looked “different and futuristic”. But the looks department isn’t only where the Gen2 outscores its predecessor, it goes much faster and that too on a single charge. Like most others, we too cringed when we witnessed our first-ever mid-race car swap in Formula E. For some reason, we were okay with tyre and driver changes during a race, but car swaps begged asking the same question every time — were electric cars fit enough to go racing? However, this reminder is set to be abolished from this season as the Gen2 car is equipped with sufficient battery power to race for 45 mins, the duration of a Formula E ePrix. If Formula 1 boasts of increasing fuel and power efficiency in the current hybrid-turbo era, Formula E will boast of doubling its battery capacity with their latest cars. The battery capacity also comes with an increase in power output. The maximum power output that the first generation cars used in qualifying (which is higher than in the race) will be used by the Gen2 car as standard power output for the entire race duration. In addition, the Gen2 car will have nearly 25% extra power for qualifying. However, despite this increase in power, the Gen2 car won’t sound like your average racing car. But that is also the point, the Gen2 car isn’t your average racing car and the ferocious engine sounds are soon going to be a thing of the past. With car swaps out of the way, mandatory pit stops will cease to exist as part of a team’s race strategy. However, this will lay more emphasis on energy management as drivers will use different modes during the race to attack, defend or maintain position while finishing the race on a single charge. Could this lead to boring races like in Formula 1 where excessive tyre management leads to predictable results? Let’s hope not, but it could take the teams and drivers a couple of races to figure optimal strategies. Sebastian Buemi, a former Formula E Champion and current Nissan driver, believes that software updates could be Formula E’s equivalent of Formula 1-style aero-development war. Since hardware specifications are frozen for the next four years, the only upgrades Formula E teams can bring to their cars are in terms of software – ones which work on better energy storage and utilisation. Additionally, Formula E will stick to Fan Boost while introducing an Attack Mode from this season. In our view, Fan Boost is to Formula E, what the DRS wing (Drag Reduction System) is to Formula 1 — frivolous. In an attempt to create fan engagement across social media platforms, Formula E allows fans to vote for their favourite drivers with the most popular ones getting an additional power boost in-race. As for the Attack Mode, the concept does seem like a genuine attempt to bringing gamification to real life racing. By driving on a different part of the race track, a driver would receive a power-boost for a limited amount of time during the race. The time period would be different for different races and the FIA would announce this closer to each race. This is to attempt teams from not factoring the Attack Mode into their race strategy. 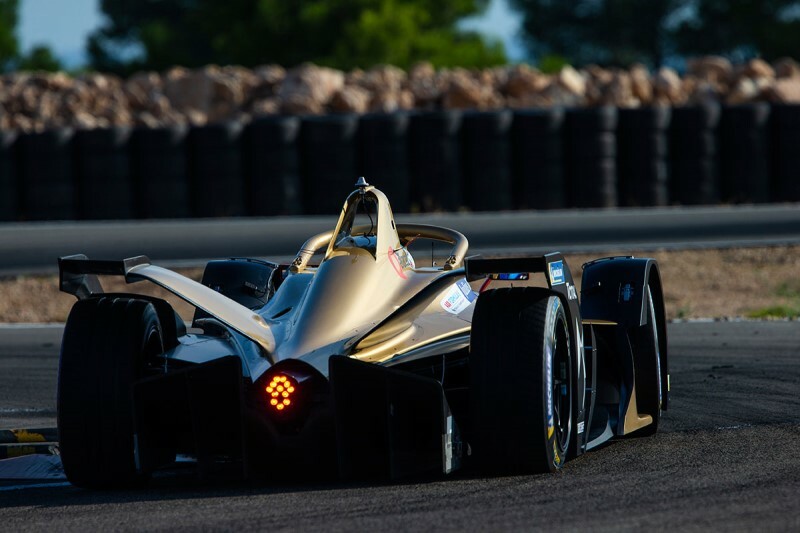 A Formula E car’s power output is in the region of 330 horsepower, nearly a third of what a Formula 1 car is capable of with its hybrid power units. In fact, Formula E’s horsepower is lesser than what the new Formula 3 championship engines will offer! Formula E has one thing that Formula 1 lacks and is desperately trying to attract — car manufacturers. With every passing season, new manufacturers are joining the series with the attempt to fuel (pun intended) their research in the electrification of the automobile. Formula 1 World Champions for the last five seasons, Mercedes, start their preparations to enter Formula E in the 2019-20 by entering partner team HWA from this season. Porsche too will enter the series from next season, after deciding to quit the World Endurance Championship to focus on their Formula E efforts. Ironically, Renault handed over their Formula E team to partner company Nissan as they chose to focus on their Formula 1 efforts. All in all, the attention and investment that Formula E attracts from car manufacturers world over is envious for any other racing series. On the drivers front, it would be somewhat comical to say that Felipe Massa is Formula E’s star attraction for this season, but he is. As with every other series, Formula E publicly tried to lure Fernando Alonso too, but the series needs to be much bigger and the cars need to be much faster to attract the former Formula 1 champion. McLaren’s former Formula 1 Stoffel Vandoorne will join the list of several other former Formula 1 drivers on the grid this season — Jean-Eric Vergne, Lucas Di Grassi, Jerome D’Ambrosio apart from other racing talents from the world of endurance racing and even Formula 2. Formula E will switch to a time-based race duration format from this season with an ePrix scheduled to last 45 mins. This will impact race strategy as teams will constantly look to recalculate their energy availability basis the number of laps remaining. Additionally, a Grand Slam is expected to be announced as a special category to choose a European Champion from the driver who scores the maximum points from the races contested in Rome, Paris, Monaco, Berlin and Bern. Formula E has worked extensively on their broadcast plans for the new season. Apart from striking free-to-air deals in key markets, the series will also offer a live stream on YouTube. The series’ influencer programs are expected to bring in new audiences to sample their racing. As with every series, new host venues have been added for the current season, Saudi Arabia being the newest and also the most controversial. If Formula 1’s challenges for hosting races is down to their race fees, Formula E’s challenges lie in having city governments agree to stop regular life for one Saturday of the year to host their road racing extravaganza. This could be one of the reasons why the series is struggling to stabilise its annual racing calendar. However, this year, the Gen2 cars will be back racing on the historic streets of Monaco. However, after early plans of using the Formula 1 layout, Formula E will be using the shorter layout. So any chances of a lap-time comparison will have to wait. The general belief is that fans are yet to warm up to this racing series even though sponsors and car manufacturers have. Is it a lack of high-profile drivers? Is it the lack of comparative speed and sound of the cars? Or is it just the overdose of racing in our lives — especially as Formula 1 has only just concluded its 21 Grands Prix long calendar? Well, whatever it may be, Formula E’s unpredictable racing is what definitely draws us towards it. Every driver has an equal shot at victory and four different teams and drivers have won championships since the first season. In fact, last season a different team (Audi) and driver (Jean-Eric Vergne) combination won top honours. The last time this happened in Formula 1 was back in 2008 and we all know how exciting a season that was. As for speed (in comparison to Formula 1), of what use are the fastest racing cars if they are unable to race each other? It’s time you gave Formula E’s refreshing approach to the sport and business of racing a bloody good shot!